The largest Muslim youth organisation in Britain, the Ahmadiyya Muslim Youth Association (AMYA) held its annual ‘Mercy for Mankind’ Charity Challenge on Saturday 16th April in Hyde Park, London. On the wet, chilly and dreary day, hundreds of members of the organisation as young as 5 gathered from across the UK to take part in the ‘Mercy4Mankind’ 10K Charity Challenge. The event welcomed the presence of MP Paul Sculley and Metropolitan Police Commander, Mak Chisty who expressed their admiration for the efforts of AMYA, especially on a chilly and wet Saturday morning. Commander Mak Chisty particularly praised the efforts to raise money for children with cancer while MP Sculley appreciated the ‘warm welcome’ received by AMYA. This year welcomed the 32nd Charity Challenge, which first began in 1985. 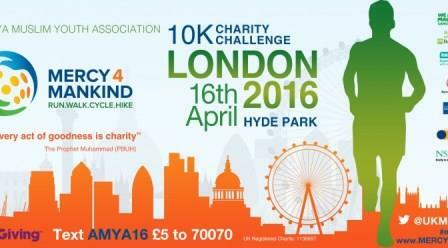 Since its inception AMYA has raised in excess of £2 million for UK charities. The event is generally hosted in a different location each year, with previous locations including the Tower of London, Battersea Park, Hampshire and the Yorkshire Dales. The beneficiaries of the money raised by the Charity Challenge include Barnardoʹs, the British Heart Foundation, CLIC Sargent, Humanity First, Macmillan Cancer Support, the NSPCC, Save the Children, the Royal British Legion, The Royal Hospital for Neuro Disability, Bloodwise, and the RNIB. 86 year old Muhammad Ahmad received the award for the ‘oldest participant’, completing the 10K walk. He has now completed over 20 such walks and raised thousands for charity over the years. The ‘Mercy4Mankind’ Charity Challenge is named after the Prophet Muhammad (Peace Be Upon Him) who Muslims believe was sent by God as a ‘Mercy for Mankind’. The event’s tagline, ‘every act of goodness is charity’ is a saying of the Prophet Muhammad who emphasised and encouraged charitable efforts towards all humanity. The event seeks to not only raise money in support of various UK charities but also to raise awareness about the true message and character of the Prophet Muhammad. In an era where Muslims are shown to be disregarding such peaceful principles of Islam, AMYA hopes this event will serve a dual purpose of not only helping charitable causes but also reminding Muslims and non-Muslims alike that Islam and its founder stood firmly for peace and unity within humanity. It is these fundamental principles which form the basis for the Charity Challenge and the work of AMYA. AMYA have been volunteering all year around in various activities. To date they have donated more than 6000 pints of blood which is equivalent to 18,000 lives saved. 145,000 trees have been planted in locations all over the nation. 40,000 food packs have been distributed to the homeless as part of weekly homeless feeding sessions across the whole country. In addition the youth have also been regularly visiting the elderly with over 1,000 visits having taken place in care homes and children’s hospitals around the country. AMYA is the UK’s largest Muslim youth organisation and the leading Muslim youth group challenging extremism in the UK. For more information about the event, or to donate, visit: www.Mercy4Mankind.org or follow @AMYA_Humanity. For information about AMYA, visit www.MuslimsForHumanity.org.uk or follow @UKMuslimYouth. Share the post "Largest Muslim British Youth Group Braves the Weather to Run and Walk for Charity"